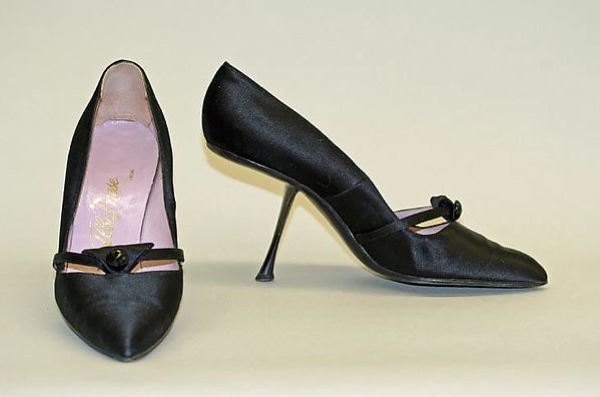 Leather and silk evening shoes dated ca.1959 says the Metropolitan. The exact date though is 1958 as per the image below from the National Productivity Council (2nd semester 1958). Close enough. Also, perusing the Albanese collection at the Metropolitan, two single sandals can be found (i.e. two different entries) sporting the same type of heel: one (left foot) is dated early 1950s, the other (right foot) is dated ca. 1958, both with the markings "Designed by Albanese | Via Lazio 19 -- Roma" and both donated by Margaret Jerrold, INC. So, it is not far-fetched to think that they are a single pair bought by either Margaret Clark and/or Jerrold Miller when in Rome. 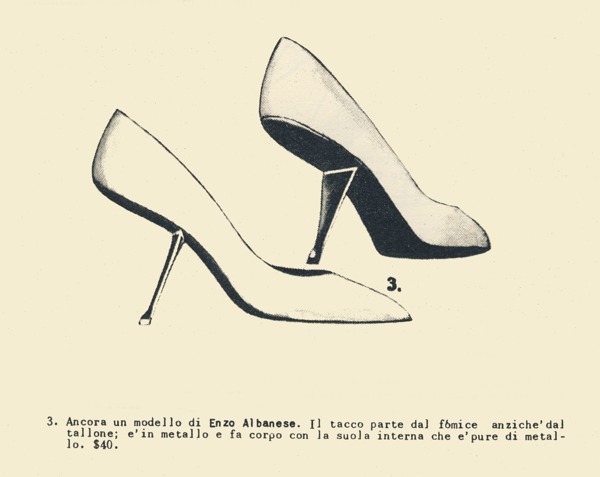 Coming up in the 1960s was Enzo Albanese, who was nearby (Dal Cò) in Rome. He was a young, chubby Roman with a beautiful, hot-tempered Calabrese wife. He specialized in flashy shoes for actresses and the "dolce vita" crowd. His heels in odd shapes, his bejeweled uppers and vibrant colors and reptiles made the Via Lazio shop an exciting place to visit.